To make Betty Crocker's cheesy potato soup in a Crock-Pot, combine potatoes, onions, celery, broth and water into a slow cooker, add flour and milk, and then cook the soup until it thickens. 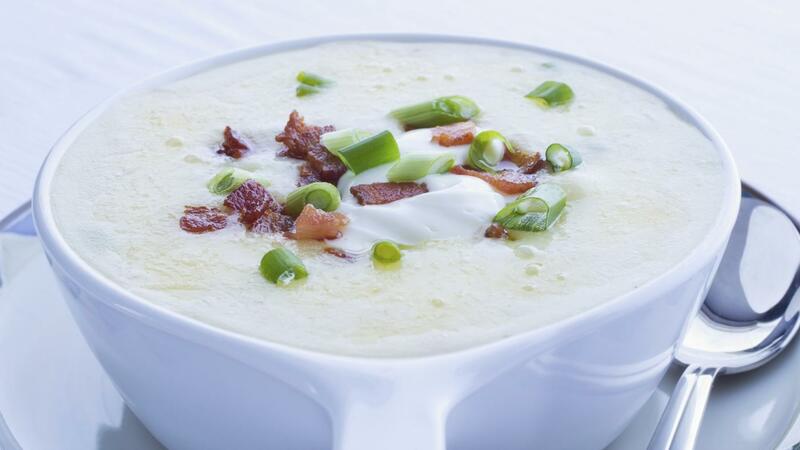 While preference varies, many people choose to garnish the soup with bacon and green onions. First, fit your slow cooker with a liner for easy clean up later. Add 1 32-ounce bag of thawed southern-style diced hash brown potatoes from the freezer, 1/2 cup of chopped onion, 1/2 cup of celery, 1 32-ounce carton of chicken broth and 1 cup of water to the Crock-Pot. Mix the ingredients together evenly, and cook them on a low setting for six to eight hours. In a separate bowl, combine 3 tablespoons of all-purpose flour and 1 cup of milk, and mix it into the potato soup. Replace the cover, increase the heat to a high setting, and cook the soup for 20 to 30 minutes. Once it thickens, add 2 cups of a shredded American-Cheddar cheese blend into the soup. After the cheese melts, ladle out individual servings, and sprinkle each bowl of soup with some chopped green onions and crispy bacon. Finish the soup with a crack of black pepper over the top for an extra boost of flavor. What Is an Easy Recipe for Creamy Potato Soup? What Is a Simple Recipe for Creamy Potato-Bacon Soup? What Are Some Good Crock-Pot Potato Soup Recipes? How Do You Make Potato Soup With Hash Browns?